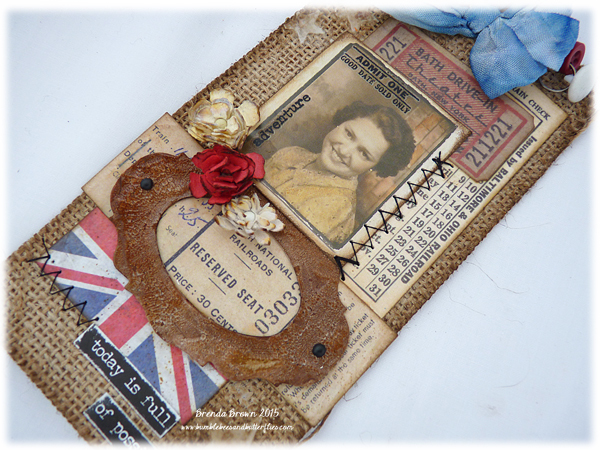 Tim's tag this month is right up my street, vintage, ephemera and collage with hessian and some texture paste - a match made in heaven methinks. Here's our little starlet, Nancy, who has travelled from England to the good ole US of A to find stardom. She arrived in New York but the small part she had in a short running play didn't lead to any further opportunities so she has decided to travel by train across to the west coast and to Los Angeles to see if she can get her name up in Hollywood lights. This is my good luck tag, hoping she will find the fame and fortune she is seeking. I don't have Tim's adhesive backed canvas so I used watered down pva and adhered some to kraft card and then cut the tag using his tag and bookplates die. (I merged two photos together here). The bookplate was cut at the same time as the tag from kraft card and sat calling me to use it, so I slathered over some rock candy crackle paint and when dry I dipped it in walnut stain distress stain, spritzed it with water and heat dried it. It now looks a bit like worn leather. As you can see I got the sewing machine out too. As I don't have the new thinlits mini flowers die I used my good old faithful tattered flower garland strip die. 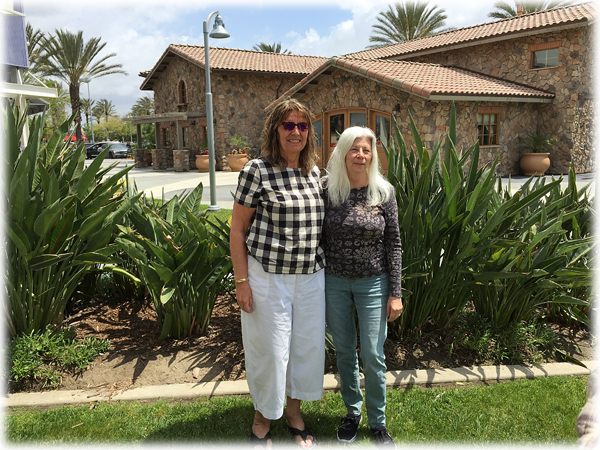 Before I go I would like to share a couple of photos from our recent trip to California. 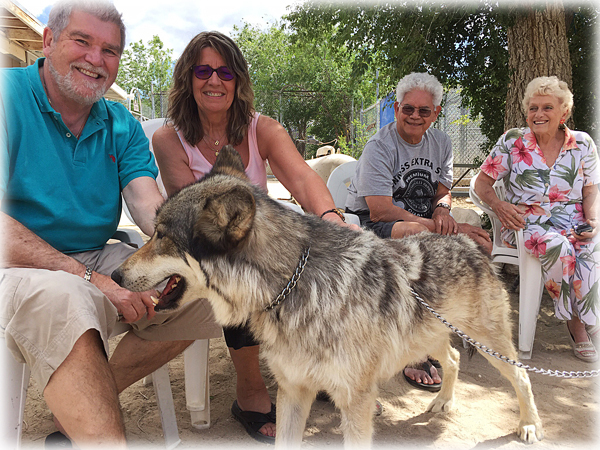 One of our visits was to a wolf sanctuary out in the wilds of the desert. Here they have rescued a number of wolves over the years which are cared for and looked after and live happily away from man's harm. These were the wolves that were filmed and appeared in the movie and the series of Twilight. One particular one is very friendly and loves to be out of his pen, he is very happy to be rubbed and fussed and will lie down by your feet. Here are Ken and I enjoying some time with him with our friends Joni and Leo. I also wanted to share a photo of my dear friend Terry and I. We were able to meet up again and go shopping together for crafty things and as we take our hubbies with us too we all had lunch together. It was such a special day with time to chat and catch up as well as spend some of those dollars I had taken with me lol. 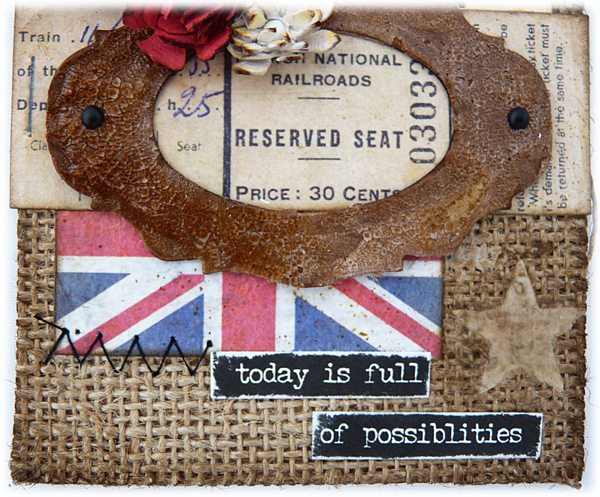 Well I hope your day is going to be full of possibilities. Woow, fantastic take on Tim's May tag, Brenda! That one is my favorite! I love everything about your tag! 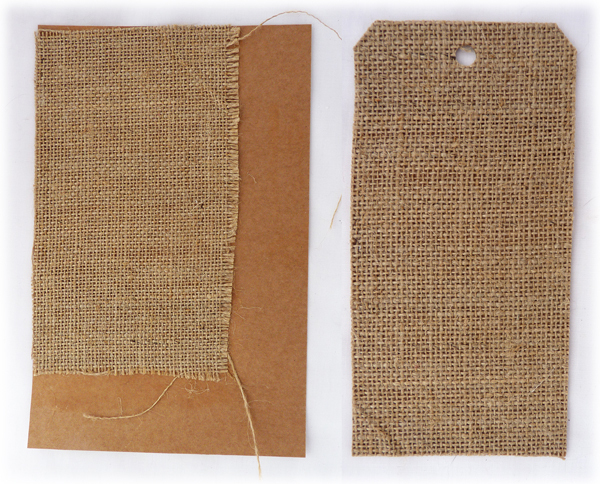 Thank you so much for sharing your idea with burlap! I am so inspired! Have a great day! A beautiful take on Tim's tag, Brenda! I especially love that your tag isn't too crammed with stuff - so all the elements you have combined create good visual "tension" and focal points. The bookplate looks fab! Love your tag Brenda & the little storyline that goes with it! I envy you your trip to the wolf sanctuary, someone in France that I know has a female wolf/dog mix & she is beautiful. Love you take on Tim's tag, Brenda, and the story that goes with it! I didn't know of the wolf sanctuary--sounds like a wonderful place. lovely tag Brenda. Glad you had such great weather and good friends in CA!! Yes I do love your take on Tim's May tag! Nancy's travel story is such fun! Wow, that wolf is amazing and I did not even know that place existed! It was great fun to empty our wallets a bit for sure and I really did like the place we ended up for lunch! I want to go back!!!! Hugs! Love your tag and I love the story that went with it. Nancy is such a pretty girl and her story is wonderful. 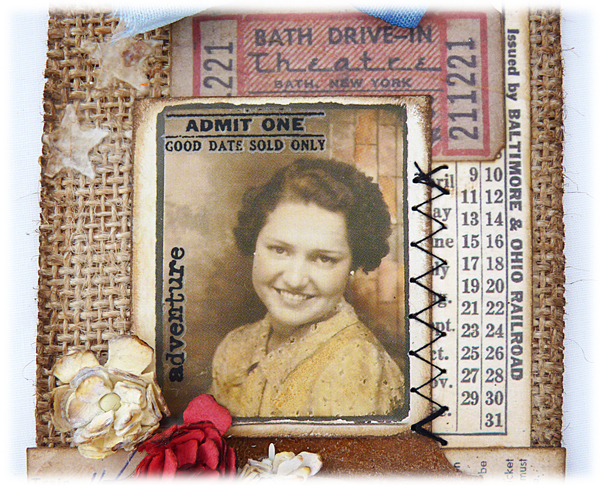 You were so very kind to make her a lovely keepsake tag with some of her special memories attached. What a great idea to go with red, white and blue - matches the flag famously! I bet she was over the moon happy when you gave it to her Brenda. It is really a FABULOUS creation and perfect for the challenge. You did great with your substitutions too. I'm sure Nancy's friend Tim won't mind in the least because it's totally stunning in every way. Looks like when you were returning from your trip in the time machine to see her you found the perfect place to land... in California. What a great time you must have had. Thanks bunches for capturing and sharing the pictures. :) j. LOVE Nancy!!! Great pics too! Gorgeous tag! Brenda you did it again : made an awesome tag !! Gosh I love the burlap, the pic, the embellishment and the way you did put it all together. You are so talented !!!! Thank you also for the photos from your trip. Oh what a lovely wolf. And how nice there are people out there who make a difference for these animals. Wow! Love your tag (tags!) There's a reason why you win! Brilliant collage work as always, and I love your weathered ornate label frame - so cool. Great to see some photos of your US trip too... how fabulous to play with wolves, and with Terry too, of course!